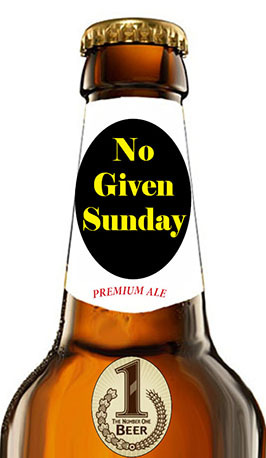 In a recent post, I lamented the continued inability to purchase beer in Indiana on Sundays. I haven’t lived in Indiana in years, but I continue to feel my former Hoosier brethren’s pain when they want to buy a six-pack on any given Sunday. It simply can’t happen without bouncing across state lines. NPR chimed in this week with an article that takes a similar stance to mine, focusing on the fact that it’s actually the liquor store owners who want Indiana to remain dry on Sunday, as well as wanting to keep cold alcohol sales exclusive to liquor stores. The liquor stores’ position is that Sunday is such a busy shopping day anyway that shoppers would simply by-pass their stores and simply pick up their beer at Wal-Mart or Kroger. Eventually, it would put these small operations out of business, since packaged beer sales are among their top revenue drivers. Meanwhile, convenience store owners, who have filed a federal lawsuit after legislation to change the liquor laws failed yet again (it didn’t even make it to committee vote), are calling foul. After I posted my thoughts on the matter, Todd Antz, who owns and operates the Keg Liquors in Clarksville and New Albany, sent me a private e-mail to set a few things straight on behalf of liquor store owners. Basically, changing the state’s liquor laws, he fears, would threaten to make Indiana liquor stores extinct, which is reasonable fear to have for a small business owner. Antz said the liquor store owners commissioned a study by a Ball State University economist in recent years that showed allowing Sunday sales alone would put 25 percent of the locally owned liquor stores out of business. Cold beer sales would equate to a 50 percent loss of those businesses, Antz said. “Just the Sunday Sales alone would cost the state over 3,000 jobs,” Antz says. Fair points all. The convenience store trade group seeks declaratory judgment and injunctive relief to overturn the current laws, which have been in place since 1963. Indiana Attorney General Greg Zoeller said he will argue that the law reflects the wishes of state lawmakers. It will be interesting to see how the suit is settled. While it stinks for my Hoosier pals to not be able to buy package liquor on Sunday, I know they also wouldn’t want to see businesses like Antz’s be negatively impacted. Who would? Maybe Hoosiers should simply go to their local Indiana brewery and pick up a growler, which actually is legal on Sunday. The beer is better than what they’d get at Thornton’s anyway.